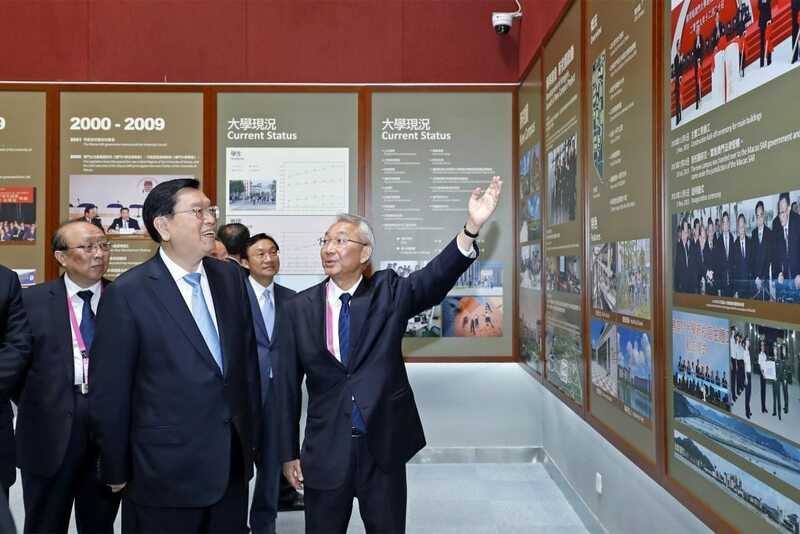 Zhang Dejiang, chairman of the Standing Committee of the National People’s Congress, visited the University of Macau (UM) on 10 May. Zhang praised UM as ‘very good’ for its campus and development. He said that UM’s new campus, which covers approximately one square kilometre, is testament to the support of the central government and the SAR government to higher education development in Macao. Accompanied by Macao Chief Executive Chui Sai On, Zhang arrived at UM in the morning and was warmly received by Tam Chon Weng, secretary for social affairs and culture; Lam Kam Seng, chair of the UM University Council; and Wei Zhao, rector of UM. Lam told Zhang about UM’s campus design, master plan, educational philosophy, and achievements in scientific research. Lam said that UM’s new campus has been developed by the right people, at the right place, and at the right time, adding that with the support of the central government and the SAR government, UM has the right conditions and room to develop itself. He also said that thanks to the joint effort of all UM members, the university has made rapid progress and has nurtured many patriotic professionals for China and Macao in recent years. Zhang used the term ‘very good’ to praise UM’s campus and development. He said that the SAR government has invested a lot of resources in UM so that the university could develop rapidly in recent years and become one of the top universities in China and the world. He said that UM’s new campus, which covers approximately 1 square kilometre, is testament to the support of the central government and the SAR government to higher education development in Macao. 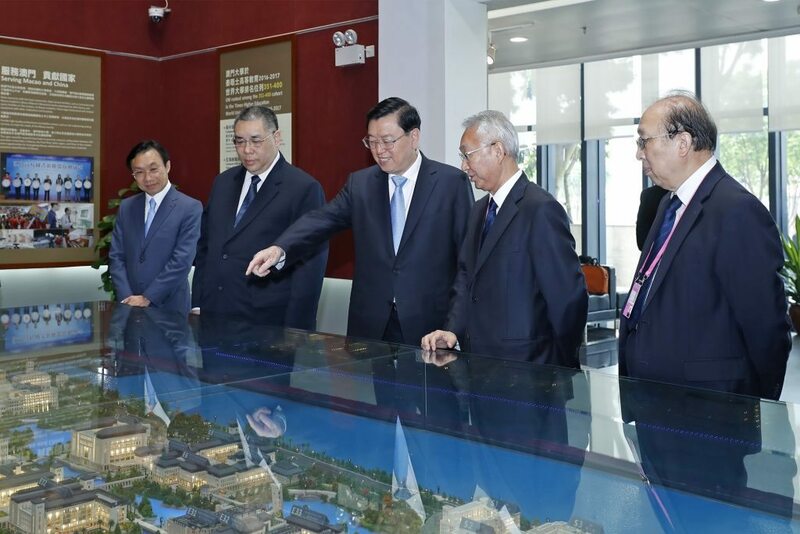 During the visit, Zhang showed a strong interest in UM’s residential college system and its latest developments in the fields of Chinese medical sciences and microelectronics. He Zhaodong, director-general of the board of directors of the UM Students’ Union (UMSU) and a student from the Faculty of Business Administration, says that Zhang’s visit is very encouraging to UM students because it shows how much he values education in Macao. Leong Keng Lon, president of the general assembly of the UMSU and a student from the Faculty of Science and Technology, says that it was a pleasure to receive Zhang at UM, adding that he is very grateful to the central government for providing a piece of land covering 1 square kilometre for UM to establish its new campus, which has provided a very good environment for students to study and live in.